The rotator cuff is a group of muscles and tendons in the shoulder that connect the upper arm (humerus) to the shoulder blade (scapula). 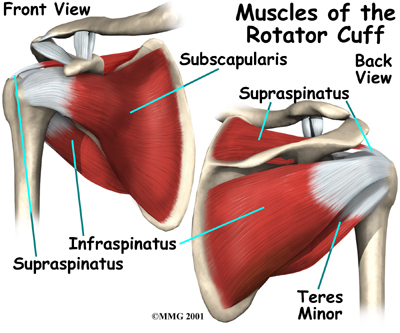 The tendons in the rotator cuff provide stability to the shoulder while the muscles allow the shoulder to rotate. These muscles and tendons also help hold the ball of your upper arm bone firmly in your shoulder socket and results in the greatest range of motion of any joint in your body. Each muscle of the rotator cuff connects to the scapula, and has a tendon that attaches to the humerus. The tendons and other tissues form a “cuff” around the humerus. Falling, lifting, and repetitive motion activities, particularly activities with overhead motion such as throwing a baseball, can all cause in injuries to the rotator cuff. A rotator cuff injury can heal with self-care measures or exercise therapy about half the time, but should be assessed by a healthcare professional.